BOSU® Balance Trainer challenges the entire body with integrated, multi-joint movement that requires muscle groups to work together. Excellent for the development of motor co-ordination, joint stability and muscular strength through instability training. Designed for lighter usage the BOSU Balance trainer is perfect for both home training as well in a fitness gym or rehab facility. 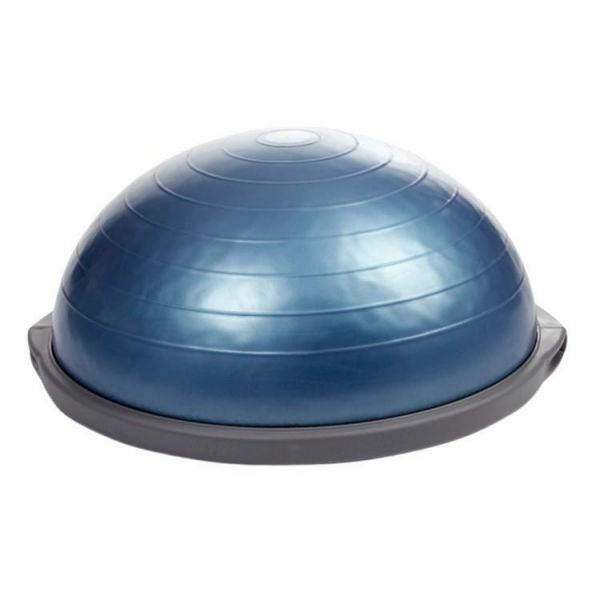 Use the BOSU® Balance Trainer dome or platform side down. The BOSU integrated balance trainer is a truly unique balance, core stability and proprioception training device. It can be integrated with all types of fitness training or stand alone as an outstanding functional tool. Standing with both feet on the "bubble", you immediately become aware of something that most of us have long since ceased paying attention to -namely, that standing is highly complex and dynamic gross motor skill. It is this awareness that is critical for further developing your central nervous system and allowing yourself to find the path of least resistance. Amazingly, there is no conscious thinking required. By simply standing on the BOSU, you will intuitively begin to find the path of least resistance, and as a result, your body will begin to move and operate more efficiently.